The Golden Tech Cambridge Lift Chair features a plush, overstuffed "biscuit back" design for long, restful hours of relaxation and sleep. 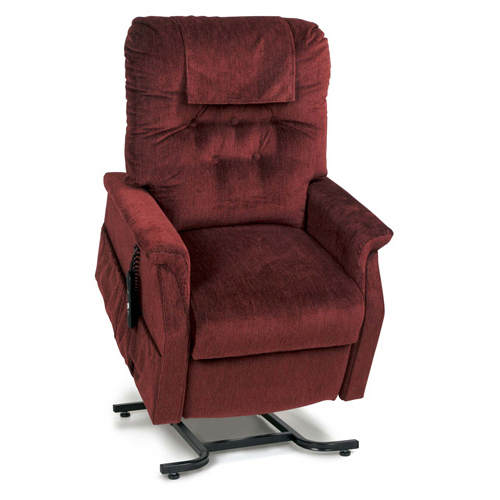 The Golden Tech Capri Medium Lift Chair combines dependability with long lasting comfort and style. The Capri has a classic Colonial button back design enhanced by a slightly firmer lumbar support area. The arms offer a wider, more rounded design for extra comfort and stability. Choose the lift/recliner that all others are measured against! Best Suited for those Between 5' 4" and 5' 10"
Floor to Top of Seat: 18"
Seat to Top of Back: 27"
Seat to Top of Arm: 7"
Floor to Top of Foot Rest Reclined: 23"
Floor to Top of Back Reclined: 35"
Distance Required from Wall Reclined: 11"
Extension Reclined from Back of Seat to End of Foot Rest: 40"
Warranty on Electrical Parts: 1 Yr.